Guess what, everybody?! It's officially FALL!! Not only by the calendar but by the weather as well! I opened my kitchen window this morning and a lovely cool crisp breeze gently blew in and filled the room with clean fresh chilly air. And as I peered out my window I noticed the tree in our backyard is beginning to show the first colors of fall! How exciting!! 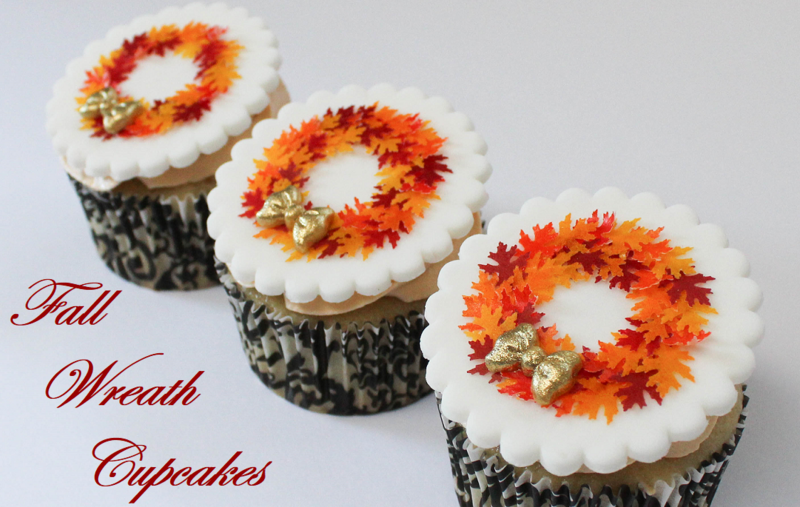 And so I thought today would be the perfect day to share a cupcake topper tutorial that was made for this season! I hope you enjoy!! 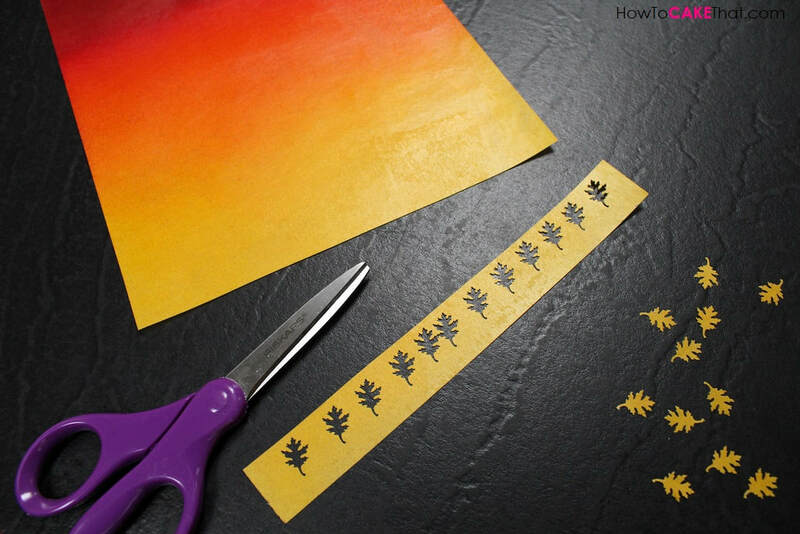 To begin this tutorial, I needed some wafer paper colored like fall leaves! I didn't have any pre-colored wafer paper on hand, so I needed to make some myself. To do this, I used my airbrush machine and airbrushed thin layers of color onto the paper, allowing each layer to dry before adding the next. 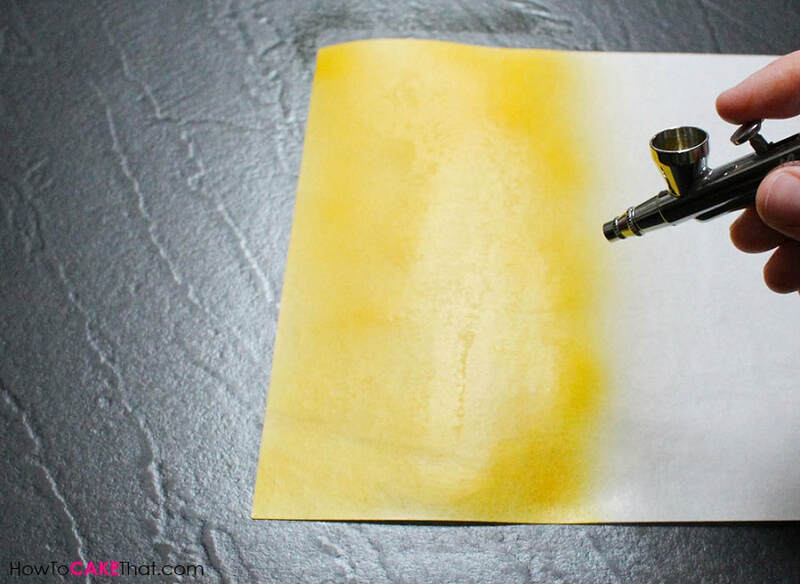 If you have time to purchase colored wafer paper ahead of time, I HIGHLY recommend doing so. 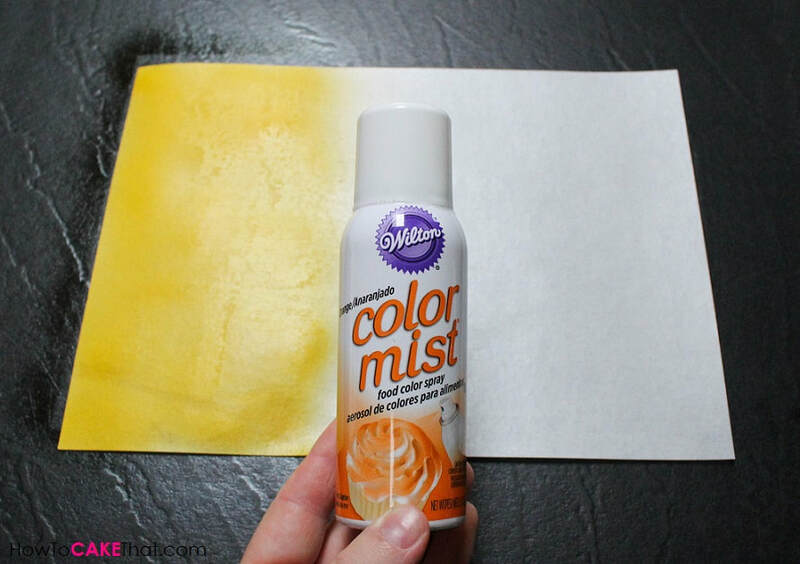 These toppers take quite a bit of time to make and not having to color the paper yourself will save you a ton of time! 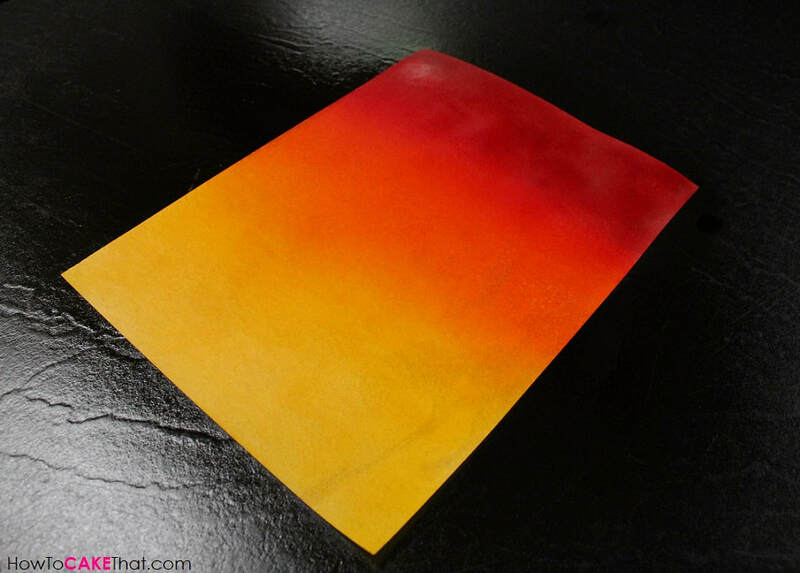 I added orange and red to my sheet of wafer paper and let it fully dry overnight... isn't it pretty!! 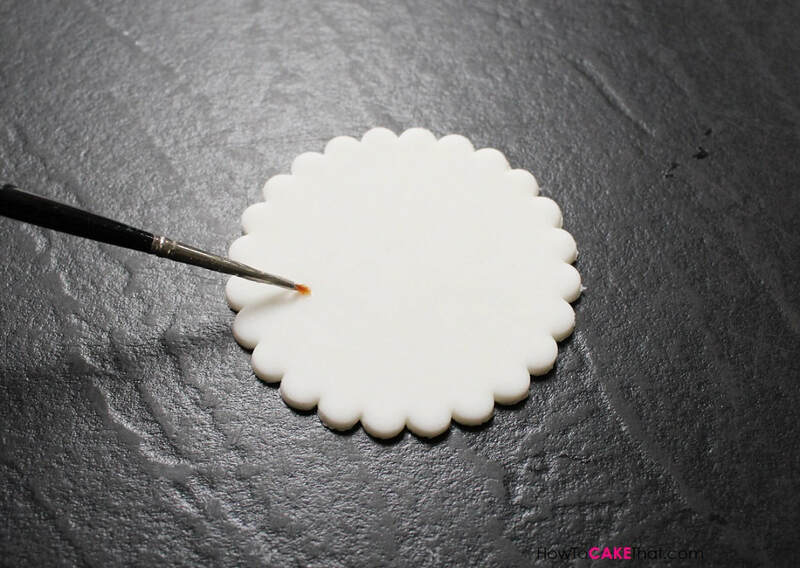 I also mixed a little Tylose powder into my white Wilton fondant and rolled it out to make the fondant disk toppers. 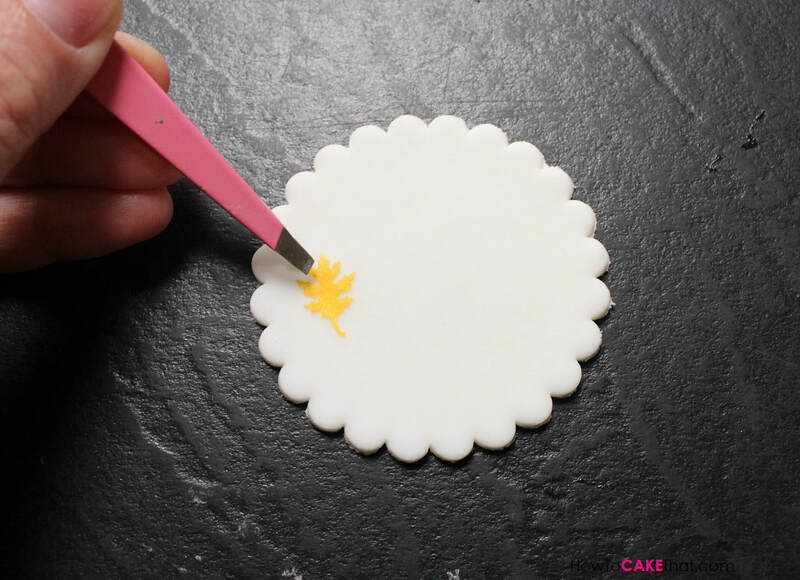 I used my Martha Stewart scalloped biscuit cutter (size 68 mm) to cut out disks for my project. 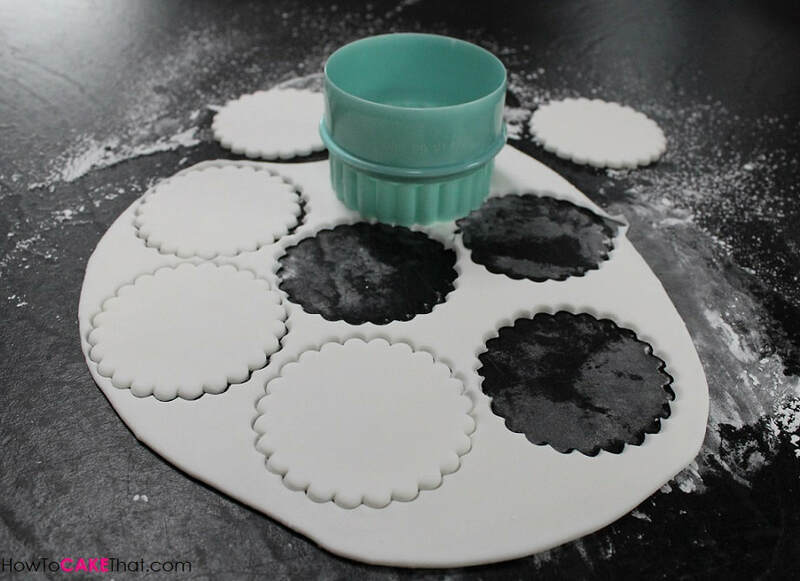 I lined a cookie sheet with wax paper and placed the disks onto the wax paper to dry. These disks can sometimes take a few days to fully dry on their own, so to speed up the process they can be placed in the oven with just the oven light turned on overnight and they will be dry by morning. I also made cute little fondant bows for the wreaths. I colored the fondant a golden color by mixing yellow Wilton food coloring with just a touch of brown food coloring. 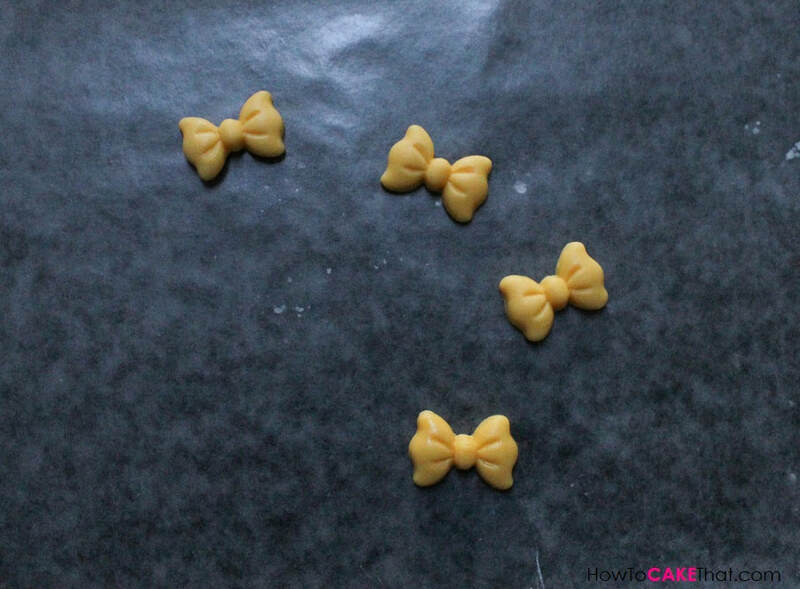 I pressed the fondant into a bow mold and let the bows dry on wax paper overnight. 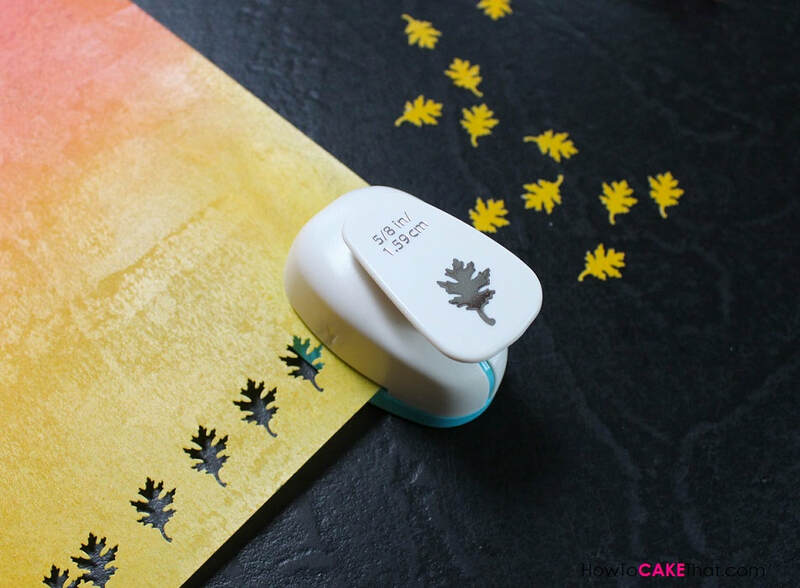 Now that the wafer paper is dry it's time to punch out our leaves! I used a Recollections craft paper punch that I purchased from my local Michaels craft store! These leaves come in two sizes and I am using the smaller size. I cut out leaves all across the bottom of the wafer paper sheet. And for each line of leaves that I completed, I used my scissors to trim away the cut paper. 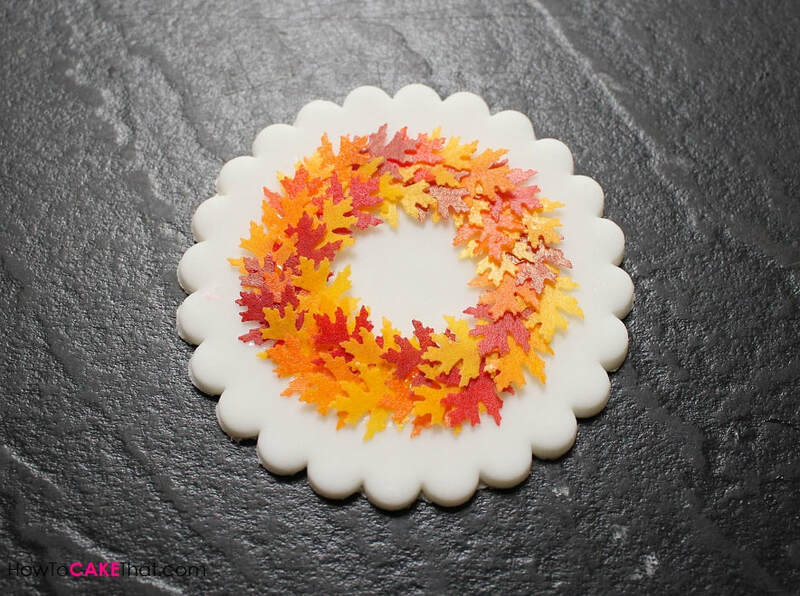 Note: Depending on how closely the leaves were cut and how many leaves are used for each wreath, you may be able to get enough leaves for 3 cupcake toppers from 1 sheet of wafer paper. 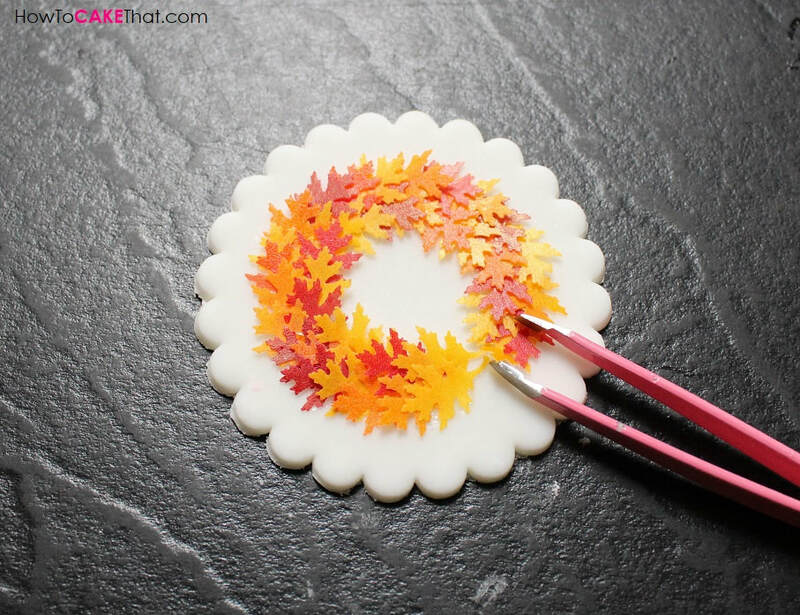 Now it's time to assemble the leaves on the dried toppers to look like a wreath. 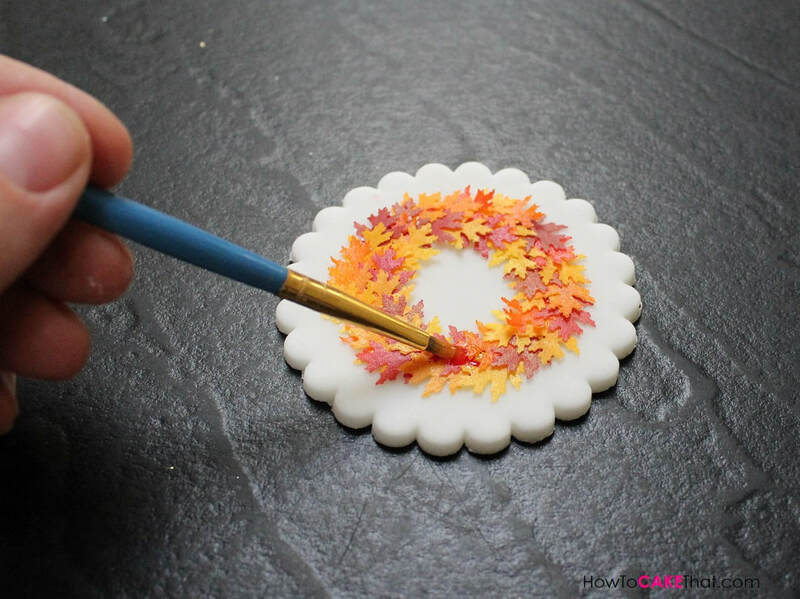 To make the leaves stick to the topper, I used a paintbrush to dot piping gel where the first leaf will sit. Then I used tweezers to carefully place the leaf onto the topper. Little by little I added more leaves. 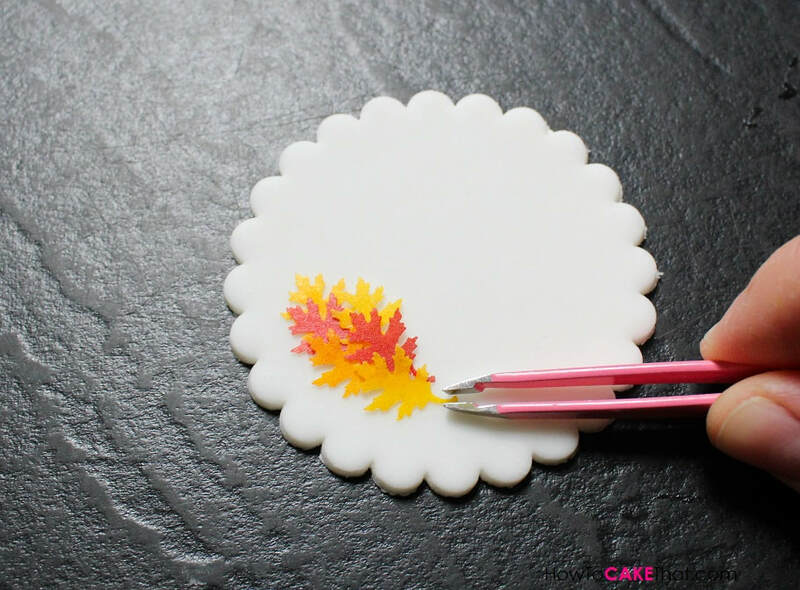 For each leaf I used my paintbrush to dot piping gel where that leaf would sit, so that each leaf would be glued to the fondant disk. 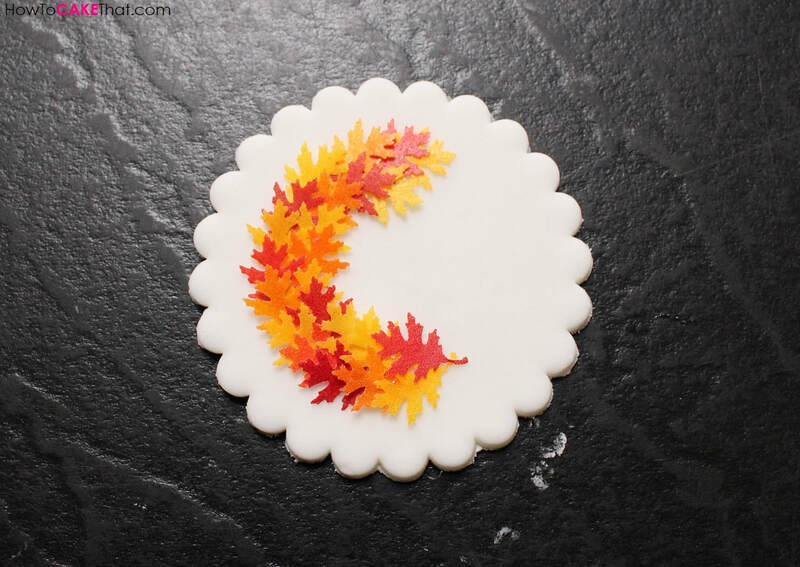 I made sure I spread out the colors of the leaves and made sure I was creating a nice round shape. As I came to the end of the wreath, I used my tweezers to hold up the area where my wreath began so the ends of the last leaves would be tucked under the first. Yay!! These colors make me so happy!! 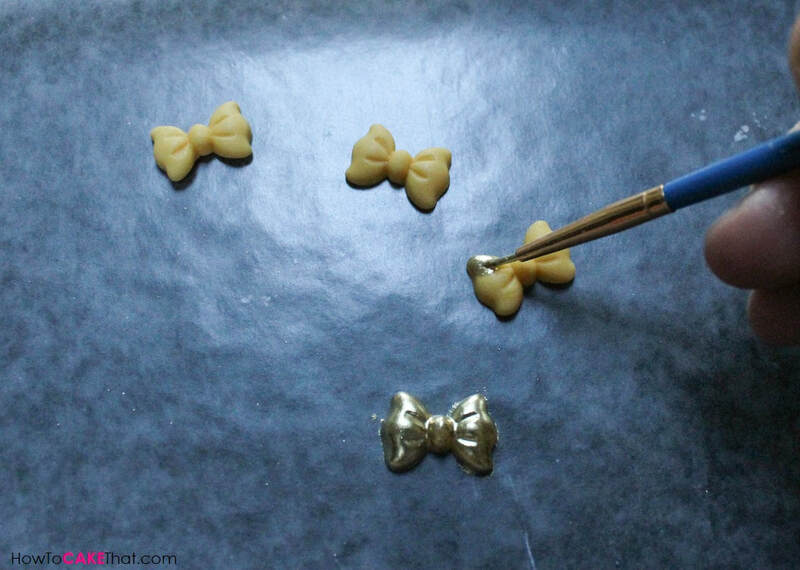 I created a paint by mixing the gold dust with a little vodka and painted it onto the bows. Then once the bows were dry, I used a paintbrush to add a little piping gel onto the wreath where the bow will be placed. 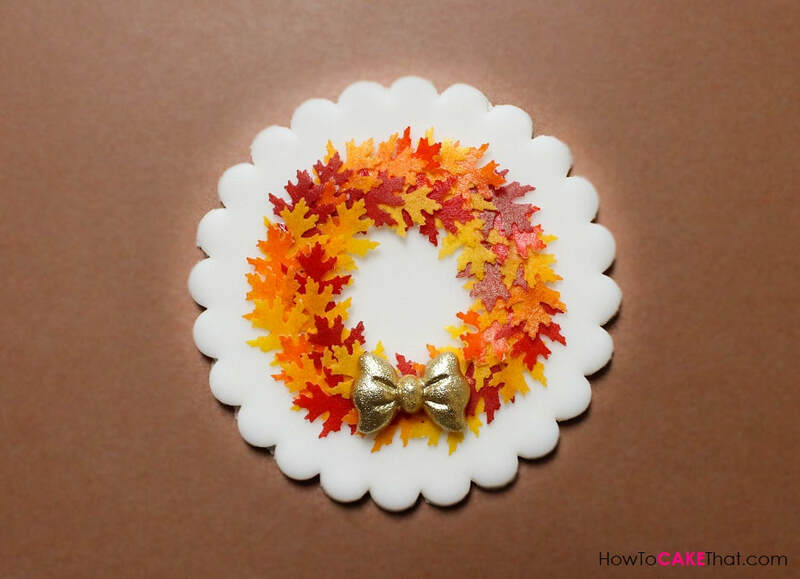 Then I placed the bow onto the wafer paper fall leaf wreath. Isn't it just gorgeous!! It kind of reminds me of a porcelain ornament! I hope you guys have enjoyed this tutorial!! Happy fall and God bless! !